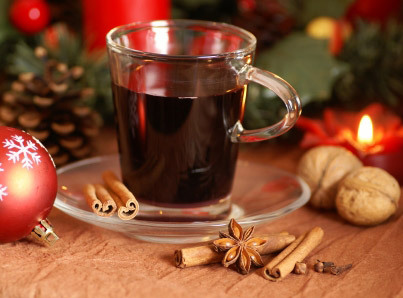 I want to share my recipe for Glühwein - a traditional European mulled wine, your best friend on chilly winter nights. It's very hearty and warming and it go straight to your head! The best drink after a ski trip or after you were on the road for 4 hours and can't feel your legs. 1 cup of dry red wine. Choose fool bodied, inexpensive wine from the South, like Australian Shiraz. First warm up the wine in a large pot and add sugar. Do not let the wine boil! Take off the peel from your citruses in a nice long curvy strip. Then squeeze the mandarins or oranges into the wine, put the spices in and let it stay on a low heat for 20 or so minutes. Do not cover the pot. Serve in thick eggnog glasses, garnish with a cinnamon stick or an orange peel. Enjoy responsively. Do not operate heavy machinery (such as snow throwers) afterwards.